The Moravian star was created more than 160 years ago at the Moravian Church and is considered to be the origin of all Christmas stars. At the beginning of the 19th century, the first paper and cardboard stars were already shining in the rooms of the Moravian Church’s boarding school. Conceived by a teacher during maths lessons, the star served to create a better understanding of geometry. From then on, the students made these stars on the first Sunday of Advent and introduced this tradition to their families. In the exhibition workshop, visitors can view the traditional way of how the small and large paper stars are made. They can also try making them themselves. Even today, the Moravian stars are still made by hand. 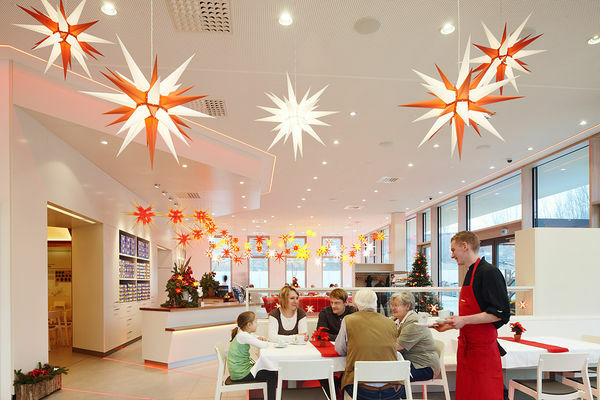 Walk into a huge Moravian star and find stories and customs of the Moravian Church and stars in the individual points. A short film that takes you into the realm of the stars completes the exhibition. Admission and guided tours are free of charge. The restaurant “BEI STERNS” invites you to relax and enjoy the bright, modern atmosphere with a view into the exhibition workshop. Regional dishes with seasonal specialities, snacks or a diverse selection of coffees and cakes are on the menu.